A web application for organizing your conference and inviting speakers to upload their presentations. 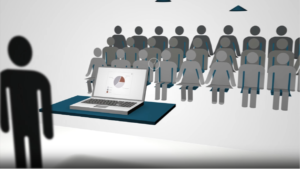 A desktop software that downloads and executes the presentations seamlessly. A publishing solution for easy web-publishing of conference presentations. When the conference program is made final it’s time to start inviting speakers to upload their presentations. Preseria Conference will guide you through this process, and whether your event features tens or hundreds of speakers, this will be an easy task. When the conference ends you might want to make the slide presentations available to the participants. Preseria Conference automatically converts all slide presentations to PDF, which you may download for offline viewing or share on your conference homepage. The presentation player supports all common presentation formats and media. It will launch these files in full-screen without displaying the computer desktop or application specific loading screens enabling a smooth transition between speakers and files. Medium and large conferences often last several days and feature simultaneous “sub-events” or parallell sessions. Preseria Conference lets you organize presentations into sessions and set the time, date and location for these sessions. Preseria Conference comes with a presentation player that automatically synchronizes itself with the online conference schedule and its presentations. This eliminates last-minute delivery of presentations on USB-sticks, makes the job easier for the technician and improves overall quality. Preseria Conference also features a one-click publishing solution, enabling you to quickly share the conference presentations. This solution generates a publishing page consisting of all the presentations in the particular conference or conference session, including multimedia and web-links used during the presentations. Preseria ensured a professional and problem-free execution of the conference. Thanks to their system we experienced no unnecessary technical interruptions and we finished right on schedule. We are very satisfied with their presentation system and the graphical design they made for the conference. Preseria made it possible to handle 750 presentations over four days without any problems. Due to a well-made interface, stability and a seamless design we made the congress run perfectly. Thanks for a brilliant software! This is the fourth year in a row that we’ve used Preseria Conference and Preseria’s technical staff to ensure that the presentations at NOKIOS were executed without problems and in a seamless and professional manner. We are very satisfied with Preseria Conference and the Preseria’s techical assistance before and during the conference. "Also check out SlideDog - multimedia presentation software for seamless playback of presentations at events"